Simtokha Dzong constructed in 1627 is the pioneer of the dzongs built by Zhabdrung Ngawang Namgyelto strengthen his domain in western Bhutan and to secure his position. What make it a worth seeing spot are the finesse slate carvings which are 300 in number. The Institute for Language and Cultural Studies is also situated here. Located on a hill, this dzong overlooks the Thimphu valley and from 500 meters above this place, the ruins of the Ta dzong is visible. History has it that this dzong was built to honor Lama Zhang who foretold that a dzong would be built at the junction of three regions, namely Sha (wangduephodrang), Pa (Paro) and Wng (Thimphu). Hence today this dzong shares its boundaries with these three regions. The place where this dzong stands was once used to be under the grip of a demon which was later subdued by Zhabdrung and enclosed it in a rock upon which the dzong is built. Hence the name Simtokha derives from the words 'Sunmo' (demon), 'do' meaning stomach and 'kha' (on). So it goes like this: a dzong on the stomach of the demon. 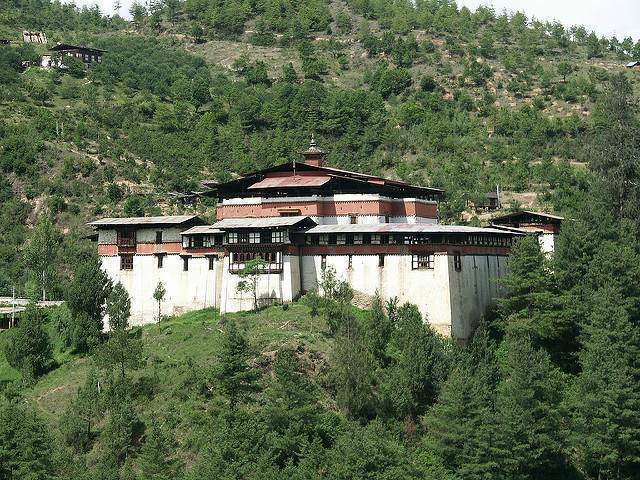 Simtokha Dzong is about 8 kilometers from the city.